Send Charming Rose Bunch to Chennai. Gifts to Chennai. Send Flowers to Chennai. 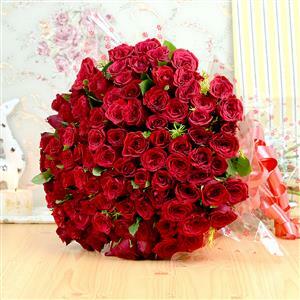 Description : The charming bunch of 100 red roses lets you to convey your love for your friends and relatives in Chennai. Finest 100 long stem red roses are bunched together to give it an exquisite look. Other adorable Gifts to Chennai showcased in Gift2Chennai.com which can also be included to make the gift more exciting. Be it one's wedding or Valentine, your loved ones will definitely adore this exotic rose bouquet.